Discover a unique space in the heart of Madrid. Located in the best area, you can arrive in less than 3 minutes to Gran Vía, Callao, or Puerta del Sol. Enjoy a spectacular design highlighted by several decoration magazines, in a comfortable and quiet, without giving up an extremely lively environment, full of restaurants, shops, theaters, etc. 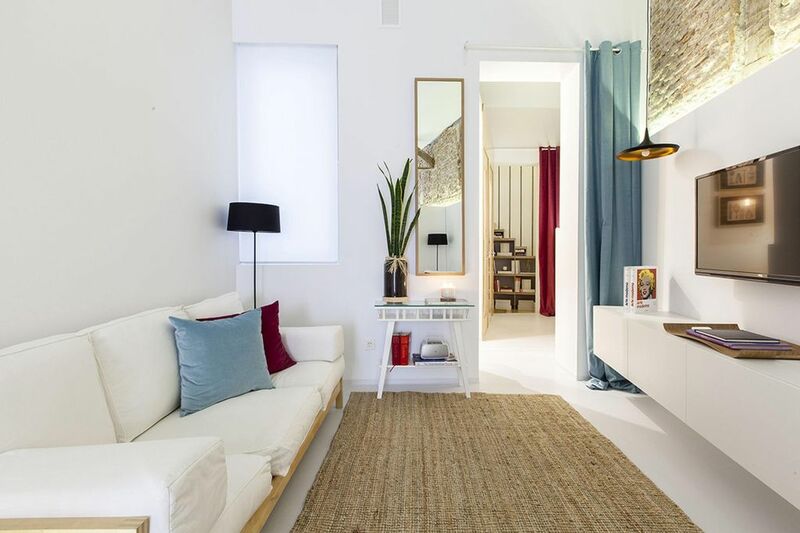 The best way to enjoy Madrid as a couple, family or friends, since it has 3 double bedrooms, living room, bathroom, and kitchen. Being a Bajo is accessed from the street directly without having to climb any stairs or access to community area. - Lounge - kitchen - dining room. -Bath distributed in 3 independent areas (toilet, toilet, shower) can be used by 3 people simultaneously. The apartment has everything you need for an extremely pleasant stay. - Sheets and towels are provided. Guests can access all areas of the apartment. We will give you the keys personally to explain the details of the accommodation. If there is a problem during your stay we are at your disposal at any time. Please note that for check-in at these times a fee is payable on the arrival of guests 20h, 20 EUR 22h, 30 EUR 24h, 35 EUR. Very close to the apartment there is a parking. In the street is also possible to park (Blue Zone). There is also a gym with Spa right next to the apartment. Check out time 11:00 Check-in hours: from 3:00 p.m.
Pasamos una semana perfecta en marzo. Esta en la major parte de Madrid y cerca a todo. El departamento estaba limpio y muy comodo. Beautiful property in an amazing location! We walked everywhere we wanted to go from this apartment. This apartment was perfect for our family of 5 for our stay in Madrid. The owners and team are very responsive and accommodating. There is a great reaturant right next door for coffee and breakfast and literally 100’s if not thousands of restaurants within a 10 minute walk. All of the major destinations to visit in Madrid are walkable from this central location. We will stay again if we visit Madrid! Highly recommend!!! Excelente situación y con todo lo necesario para disfrutar!!!. El apartamento está muy bien situado. A un paso de muchos lugares turísticos. Silvina fue muy atenta con nosotros. Hay un párking público justo al girar la esquina. Por poner un pero, se escucha algo un ruido de máquinas desde el deslunado, aunque no molesta en absoluto para descansar confortablemente. Colchones nuevos.